inscription: Per S.B. - Verso " Pond Farm" and jug image stamped. 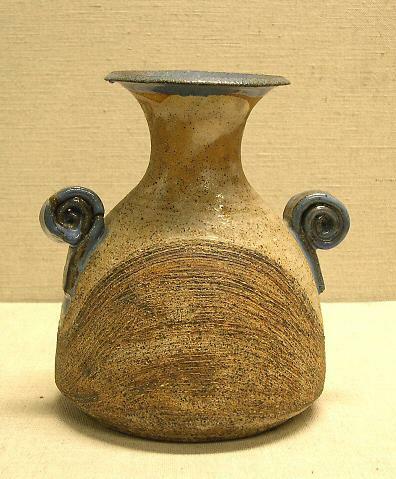 Vase with two handles. buff stoneware. Lower part of body is stout. There are inscribed, fine, parallel grooves within a curved form. Clay handles are spiraled. Outer rim of flaring neck and interior and handles are glazed bright blue, with white and orange glaze on body.